Many businesses might be wondering if they should start a blog. Some might already have a blog, but just don’t get the time to post consistently. Blogging can be one of the most valuable communication things in your marketing toolbox. To give you a nudge to make a start, here are eight reasons (in no particular order) why you might want to consider starting a blog. Blogs get your website found by potential clients. Each time you write a new blog, it adds a page to your website and refreshes your website content. These both lead to higher search engine rankings. With careful use of key word search terms and content written for search engine optimisation (SEO), a good blog increases your chances of your ideal clients finding you. To expose your blog to an even wider audience of ideal clients promote your new blog posts through social media and PR. Blogs position you as the go-to-expert or a thought-leader. Posting content that is interesting, useful and helpful for your clients, shows your expertise and makes you or your business stand out from your competitors. It’s important your blog isn’t used as another sales platform. It should provide valuable advice and information for your clients. Blogs tell your brand story and strengthen and develop your brand. A blog is a great place tell your clients why you are in business and how you can help them. Showing your business values, your employees and activity in the office all makes your business become more personable. 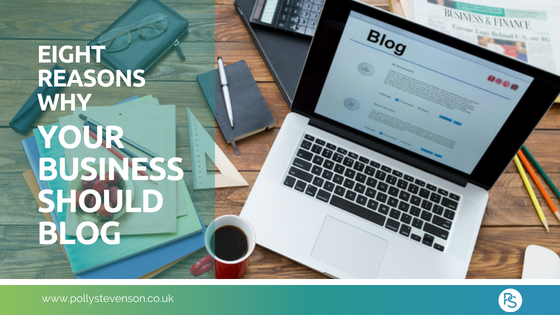 People do business with people or brands they like and trust so your blogs will help to develop a loyal following. Blogs convert your followers to leads and clients. According to Hubspot companies that blog generate 68% more leads per month. By frequently providing useful information, you will build trust and loyalty with your ideal clients. It is easier to convert loyal followers into paying clients. Blogs help build email or subscription lists of interested clients. Your ideal clients will be happy to subscribe to receive a link to your latest newsletter, e-book or other offerings if you regularly post valuable information. Blogs help you learn more about your clients. Encouraging comments on your blog posts gives you the opportunity to engage with your clients and to gain feedback and insight into their needs. You can then adapt your marketing if needed. Blogs integrate with all other marketing activity. You can promote events and company news in your blog as well as in press releases. Your social media can direct to your new blog posts or point back to older relevant posts. Your email newsletter can link back to blog posts and you can create client case studies in your blog too. Blogs empower employees and strengthen your team. Asking your staff to contribute posts gives them ownership and interest in the blogs and helps them develop their writing skills. It also saves you time as you don’t need to write every blog yourself. If you haven’t started a business blog or want to get better results from one you have already, these reasons may help you to start or get back into the swing of regular and effective blogging. Do you need some help with your blog? If you need help in planning what to write in your blog or with writing your blogs, I can help. Please get in touch to find out more.